It should come as no shocker that I like playing host. While my Meatwaves serve as my primary outlet to fulfill that desire, it's always been a little hard to deal with the fact that I could never truly transfer my hosting skills to larger family gatherings at holidays. This was originally due to very limited indoor space in my old Astoria apartment, and then was a problem of my own making when I moved to North Carolina, resulting in isolation from my extended family. For the first time though, this Thanksgiving is different. Family from New York, Virginia, and Texas are all descending upon Durham to partake in our largest holiday feast yet. I originally had a lot of excitement about this development, but that was followed by the realization of the complications it creates when cooking for a crowd when all the food needs to be done at the same time. This will render my oven space inadequate and will force me to consider other means cooking, which is really no problem at my house since I have a couple grills and smokers on hand. 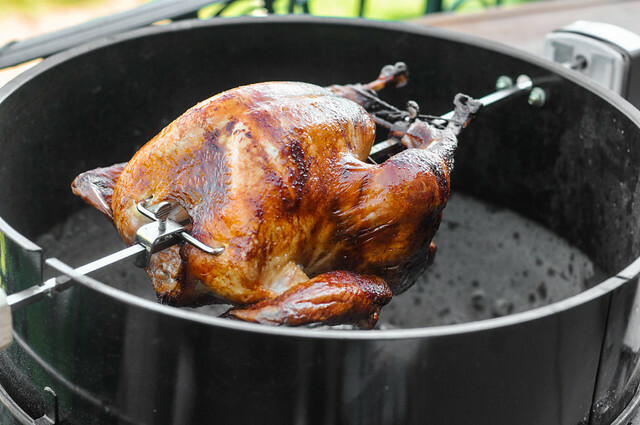 Moving in that direction made me consider reviving this rotisserie turkey recipe I made almost eight years ago and never shared on the blog mainly because I didn't feel the photos were up to snuff to my standards. So you'll have to pardon the less than ideal images and know this was a turkey so great that I feel it's a worthy contender to create a best in show bird for my forthcoming large family meal. I'm not really sure why I don't cook duck more often. In many ways, it reigns supreme over other poultry—it's definitely more flavorful and fattier than your chicken and turkey mainstays, which are huge plusses in my book. I guess the fact that it's not normally out with the standard birds, tucked away often in the freezer section, makes it kind of out of sight and out of mind. 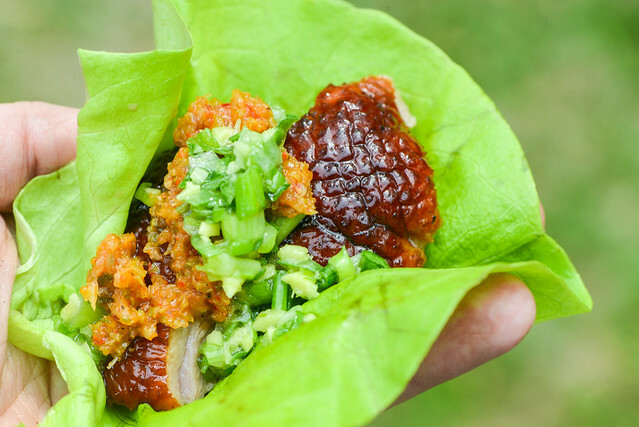 When I was considering making ssams—essentially Korean lettuce wraps—for a Meawave recently, duck did jump right up there as a great idea for a meat filling, and I'm glad it did because this smoked duck ssam was really amazing. When I decided to make smoked porchetta, the impetus was really to have these very specific sandwiches. See, the week prior to that Meatwave I was in Vancouver for a conference and right next to the venue was a sandwich shop I had read about and always wanted to try—Meat & Bread. 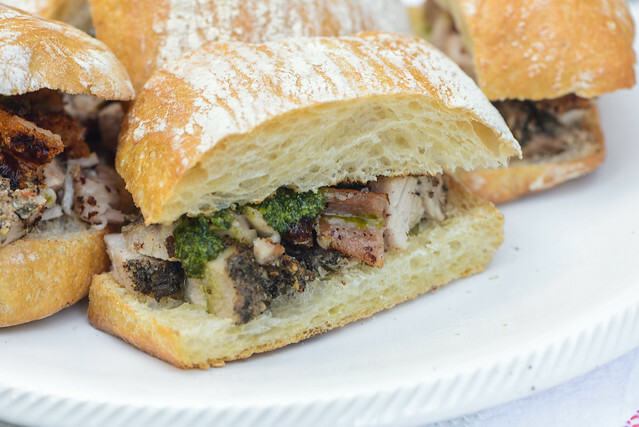 They're signature item is a sandwich that combines porchetta meat, crackling pork skin, and Italian salsa verde together on a toasty ciabatta roll. Of course, I had to get this while there, and while the sandwich looks and sounds seemingly simple, it was an incredible powerhouse of flavors and textures that left me craving more after finishing the last bite. So what was the best way to get more once 3000 miles away from the restaurant? Make it at home! I had it all planned out, the centerpiece of my Italian-themed Meatwave was going to be a massive pork loin that I was going to butterfly, stuff with prosciutto, sopressata, provolone, and basil, then roll close and grill. I'm sure it would have been impressive and excellent, but a slight wrench was thrown into my plans—I was given a BBQ Guru CyberQ Cloud to take for a spin, and with a lot time away from home recently, if I didn't try it out on that Meatwave weekend, I probably wouldn't get to it until at least a couple months later. I could have chosen to smoke the pork loin in order to make use of the device, but the rather fat-devoid loin isn't ripe fodder for low and slow cooking, which favors fattier cuts. 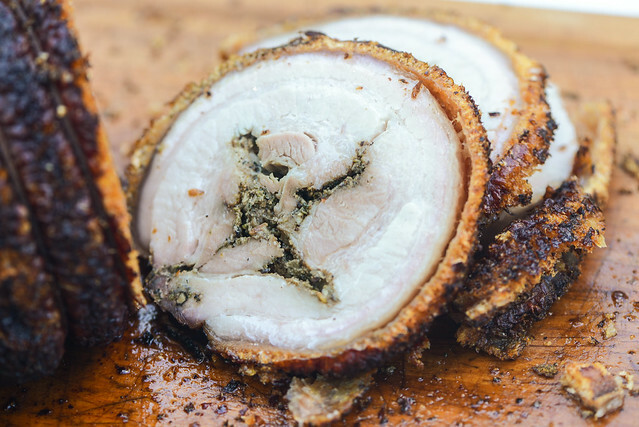 Then the perfect idea came into my head—ditch the stuffed loin and do a smoked porchetta. The fat-laden pork belly required for porchetta is perfect smoking, and a porchetta would be equally worthy to serve as the centerpiece meat for the day. There are few delights that rival the skin of an excellent rotisserie chicken. 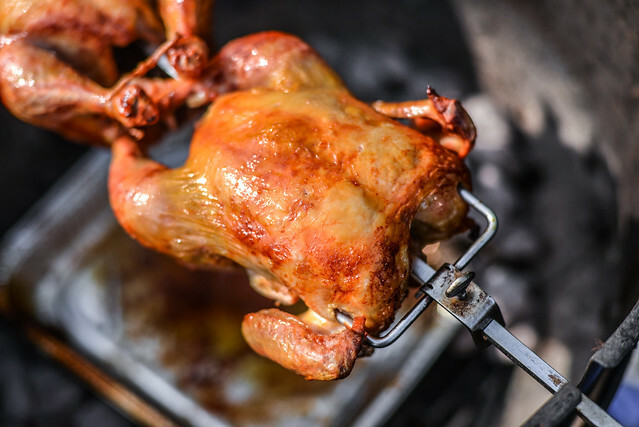 Sure the juicy, flavorful meat is great, too, but the thin, browned skin that's crisped up in the bird's own slowly rendering fat is something I live for—it's the reason I got a rotisserie attachment for my grill in the first place. But three years after receiving that gift, I realized I was too hung up on specialty birds like Peruvian and mojo chickens; shamefully, I'd never cooked a single standard rotisserie chicken. I decided it was high time to right that wrong and set out to perfect the basics.